Promotes Vibrant, Youthful Hair in Just 2 Weeks! 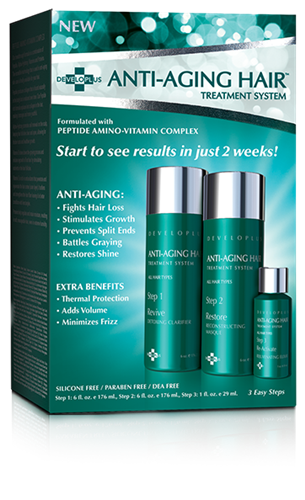 Helps slow down graying and reduce hair loss with our Peptide Amino-Vitamin Complex. Helps repair and reinforce the hair shaft to prevent micro-fractures. Helps remove dulling residue to reveal your hair's natural shine. Helps moisturize and deep conditions hair to eliminate dryness and tangles. Promotes thickness and volume while reducing fizz. Helps protect hair from daily thermal heat and the sun's UV rays. Specifically formulated to fight the signs of aging for all hair types. 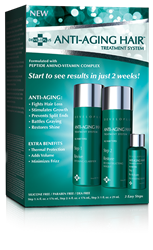 Peptide produces collagen that is found naturally in the body but is reduced over time. Our Peptide rich formula helps replace lost collagen in the hair, making it stronger and more youthful. Alpha-Hydroxy promotes cell renewal on the scalp, keeping hair follicles clear and open, allowing for thicer roots and healthier growth. Vitamin B helps slow down the graying process and initiates regrowth of lost hair by stimulating nutrients in the hair follicles. Vitamin E is rich in antioxidants that penetrate and help rejuvenate the hair cortex (outer layer). It helps soften and strengthen the hair fiber leaving it in better condition with less tangles. Revive is a detoxing clarifier, formulated to help remove dull residue that hides your hair's natural shine. Revive helps nourish your hair without weighing it down, revealing more luminous tones. Revive replaces your shampoo. Restore is a 5-minute reconstructing masque formulated with our Peptide Amino-Vitamin Complex to help minimize the graying process, initiate regrowth of lost hair and strengthen your hair's natural fiber. Restore penetrates your hair to help repair micro-fractures, eliminate dryness and control frizz. Restore replaces your conditioner. DeveloPlus, Inc. is cruelty-free. No animal products. No animal testing. Revive: Water, Sodium Laureth Sulfate (Coconut Oil Derived), Cocamidopropyl Betaine (Coconut Oil Derived), Decyl Glucoside (Sugar Plant Derived), Glycol Distearate, Glycerin (Natural Humectant), Passiflora Edulsis (Fassion Fruit) Seed Oil, Oriza Sativa Rice Bran Oil, Euterpe Oleracea (Acai) Pulp Oil, Cocomidimonium Hydroxypropyl Hydrolyzed Soy Protein, Niacinamide (Vitamin B3), Phytantriol, Panthenol (Vitamin B), Hexylene Glycol, Tocopherol Acetate (Vitamin E), Hydrolyzed Wheat Protein, Trimethylsilylamodimethcione, Peg-12 Dimethicone, Aloe Barbadensis (Aloe Vera) Leaf Juice, Laureth-4, Phenoxyethanol, Ehtyhexylglycerin, Laureth-23, Disodium EDTA, Fragrance. Restore: Water, Cetearyl Alcohol, Saccharum Officinarum (Sugar Cane) Extract, Citruc Limon (Lemon) Fruit Extract, Pyrus Malus (Apple) Fruit Extract, Camellia Sinensis (Green Tea) Leaf Extract, Hexapeptide-11, Superoxide Dismutase, Foeniculum Vulgare (Fennel) Seed Extract, Betaine, Sodium Cetearyl Sulfate, Passiflora Edulsis (Passion Fruit) Seed Oil, Oriza Sativa Rice Brain Oil, Euterpe Oleracea (Acai) Pulp Oil, Visnaga Vera Fruit/Stem Extract, Behentrimonium Methosulfate, Stearalkonium Chloride, Polyquaternium-37, Cocodimonium Hydroxypropyl Hydrolyzed Soy Protein, Propylene Glycol Dicaprate Dicaprylate, Cocos Nucifera (Coconut) Seed Oil, Butyrospermum Parkii (Shea Butter), Phylantriol (Vitamin B3), Orbignya Speciosa Kernel Oil, Tocopherol Acetate (Vitamin E), PPG-1 Trideceth-6, PEG-40 Casotr Oil, Glycerin, Panthenol, PEG-90M, Hydrolized Wheat Protein, Polyquaternium-67, Aloe Barbadensis Leaf Juice, Phenoxyethanol, Ehtyhexylglycerin, Disodium EDTA, Fragrance. Re-Activate: Water, Saccharum Officinarum (Sugar Cane) Extract, Citrus Limon (Lemon) Fruit Extract, Pyrus Malus (Apple) Fruit Extract, Camellia Sinensis (Green Tea) Leaf Extract, Hexapeptide-11, Superoxide Dismutase, Foeniculum Vulgare (Fennel) Seed Extract, Betaine, Passiflora Edulsis (Passion Fruit) Seed Oil, Oriza Sativa Rice Brain Oil, Euterpe Oleracea (Acai) Pulp Oil, Visnaga Vera Fruit/Stem Extract, Cetrimonium Chloride, Glycerin, Polyquaternium-37, Hexylene Glycol, Phytantriol (Vitamin B3), Orbignya Speciosa Kernel Oil, Panthenol (Vitamin B), Tocopherol Acetate (Vitamin E), Hydrolyzed Wheat Protein, Cocodimonium Hydroxypropyl Hydrolyzed Soy Protein, Aloe Barbadensis (Aloe Vera) Leaf Juice, Phenoxyethanol, Ethylhexylglycerin, Disodium EDTA, Fragrance. Revive: Apply to wet hair; massage, lather and rinse. Restore: Apply to clean wet hair and leave in for 5 minutes, then rinse. Re-Activate: Apply 1 - 2 drops to damp hair as a leave-in treatment. AG Colour Savour Sulfate-Free Shampoo - 10.0 oz. Arte Hair Lotion 280ml Livegain Botanical Scalp Tonic AG Colour Savour Colour Protection Conditioner - 6 oz.